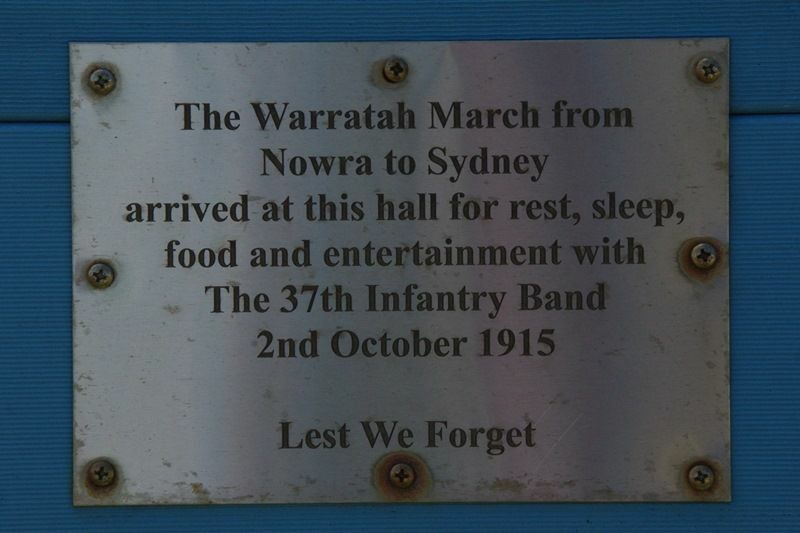 A plaque erected in remembrance of the Waratah Recruiting March which arrived at the hall on the 2nd October 1915. During World War One, a number of recruiting marches were held to recruit volunteers “to fight against the Hun”. 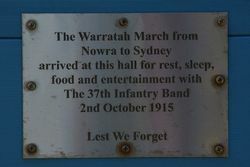 One of these was the Waratah March which began in Nowra on 30 November 1915 and passed through Bomaderry, Meroo, Berry, Gerringong, Kiama, Jamberoo, Albion Park, Dapto, Unanderra, Port Kembla, Wollongong, Balgownie, Corrimal, Woonona, Bulli, Thirroul, Coledale, Scarborough, Stanwell Park, Helensburgh, Heathcote, Sutherland, Hurstville, Kogarah, Rockdale, arriving at The Domain, Sydney after an 18 day trek. 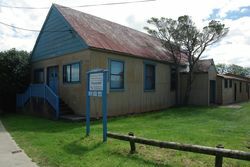 The volunteers marched under the Waratah Banner and wore civilian clothing including distinctive white hats and waratah badges. They entered camp at Liverpool on 17 December 1915. After training, most left Australia between March and June 1916 as 1st Battalion reinforcements to fight at Pozieres in France.